D. Floyd Construction Ltd. maintains a large fleet of service vehicles and machinery and searches year round for Qualified, Responsible and Eager individuals that understand and desire to be part of a team driven for success in a safe working environment. As the company has grown, we strive to continually improve on our performance, the search for new products, customers and employees that strive to not only improve themselves every day but also those who work around them. The scope of work we desire requires a constant environment of seeking more and better ways to allow us to continue our growth in an environment of skill and safety in the workplace. If you are interested in joining our growing construction business in Calgary. We welcome your inquiries for all positions related to our project work. 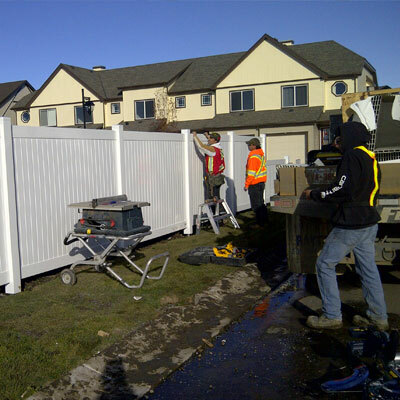 We seek experienced wood fence installers for year round assignments. We provide projects for workers exhibiting quality workmanship, good work ethic and excellent attendance.We seek full time employees only and not interested in sub contractors at this time. General Laborers Needed for Outside construction duties. Need to be fit and able to handle up to 50 lb.lifts on a regular basis. Looking for good work ethic and excellent attendance. We are looking for full time machine operators for year round fencing / auger work. Minimum 2 years experience, drivers license w/ abstract and ambition a requirement. Contact by email with your contact info and we will get back to you.